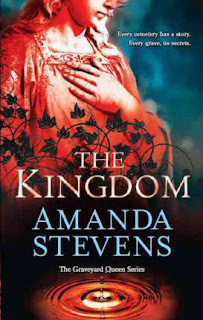 This book was nothing like I expected it to be and yet it manages to advance the Graveyard Queen series in a way that maintains the tone and answers some of the questions set up in The Restorer. It has elements of horror. It has danger. It, of course, has ghosts. But what it doesn’t have… is John Devlin. But I’ll get back to that in a minute. It’s been a few months since the events of the last book and Amelia has accepted a new job in a new town called Asher Falls. She has been trying to keep her distance from Devlin and she feels like this new project will help her do that. But even aboard the ferry –on her way to the secluded town– there are signs of trouble. An underwater graveyard is one –a mysterious and compelling man is another. In Asher Falls, she finds a place that’s cut off from the rest of the world. A powerful family is responsible for its ruin and, perhaps, things which are much worse. There is an undeniable evil in the town. It recognizes Amelia and she becomes a target, in more ways than one. I’m not going to get into the details of the plot, because I don’t want to ruin the surprises and revelations. I will say that I wish I would have re-read The Restorer before beginning this installment. I found myself struggling to remember some of the particulars that were only mildly referenced here. Perhaps because of that, I had a little bit of trouble getting back in the groove at the beginning of the book. Or maybe because –with a new town and a new supporting cast– I almost felt like we were starting over. I was intrigued by the new love interest… but I was very put out that the Devlin storyline was put on the back-burner. I liked learning more about Amelia’s past and what makes her who she is. I’ll admit that I figured out the “big reveal” early, but I certainly wouldn’t call it predictable –and other elements of the story still managed to surprise me and keep me guessing until the very end. I loved this book. But the last 3 words were torture, I am so glad I had book 3 on hand to jump to. Great Review! I loved the ending. Though I probably would have considered it torture if I had to wait too long before The Prophet!! Yes!! You should be ok reading this first b/c it kind of takes a break from the storyline set up in The Restorer. But you REALLY need to pick up the first book before you read The Kingdom! That last line was epic! I just got this on the Kindle today and I’m so looking forward to reading this ASAP I love Amelia.